Home Common Questions Answered Is there historical evidence for the darkness & earthquake at the crucifixion? Home / Common Questions Answered / Is there historical evidence for the darkness & earthquake at the crucifixion? The maximum duration for a total solar eclipse is seven minutes, not three hours, and at the latitude of Jerusalem the maximum duration is even less. 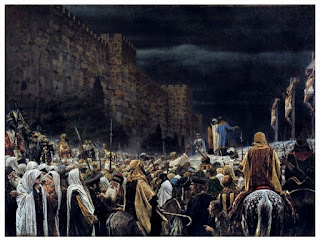 A solar eclipse can occur only at new moon, but we know that Jesus was crucified at the time of Passover (Matthew 26:2; Mark 14:1–2,12; Luke 22:1–2, 7; John 13:1), and that the Passover is at the time of full moon (Exodus 12:1–11; Leviticus 23:5). The New Testament records the three-hour darkness during Christ’s crucifixion (Matthew 27:45, Mark 15:33, Luke 23:44–45). But it is also confirmed by four other historians outside the Bible: Phlegon, Thallus, Africanus and Tertullian. These historians attempt to interpret the darkness as a direct effect of a solar eclipse which we know is scientifically not possible - but they wouldn't have known that in their time. Thallus wrote a history of the eastern Mediterranean world since the Trojan War. Thallus wrote his regional history in about AD 52.6. Unfortunately his original writings have been lost, however he is specifically quoted by Julius Africanus as in the quote above, and Africanus was a renowned third century historian. 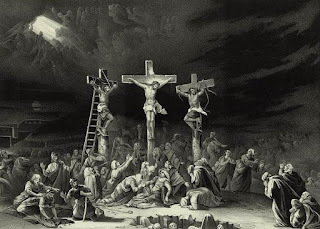 Africanus stated, ‘Thallus, in the third book of his histories, explains away the darkness as an eclipse of the sun—unreasonably as it seems to me.’ 3 Thallus attempted to give a naturalistic explanation to the darkness during the crucifixion. After three hours of darkness at midday on April 3, 33 A.D., Jesus died on the cross. Immediately, the curtain of the sanctuary of the temple was torn, a great earthquake occurred, and rocks were broken. 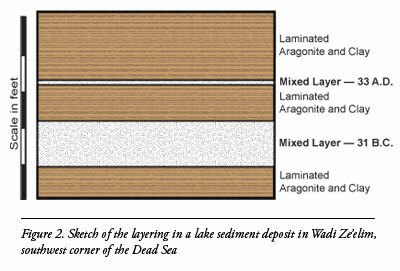 In Wadi Ze’elim, located above the southwestern shore of the modern Dead Sea exists an outcrop of laminated Dead Sea sediment. This sediment outcrop is a distinctive one-foot thick “mixed layer” of sediment that is tied strongly to the Qumran earthquake’s onshore ground ruptures of 31 B.C. (see Figure 2 below). Thirteen inches above the 31 B.C. event bed is another distinctive “mixed layer” less than one inch thick. The sedimentation rate puts this second earthquake about 65 years after the 31 B.C. earthquake! (31 B.C. + 65 yrs = 33 A.D) There is direct physical evidence in the thin layer of disturbed sediment from the Dead Sea, of an earthquake around 33 A.D. The evidence also shows it likely to have been a magnitude 5.5. Secular Geologist, Jefferson Williams of Supersonic Geophysical, and colleagues Markus Schwab and Achim Brauer of the German Research Center for Geosciences, researched the Dead Sea and revealed that at least two major earthquakes occurred: A widespread earthquake in 31 B.C. and a seismic event that happened sometime between the years 26 and 36. Thus, this earthquake was clearly the one at Jesus' crucifixion. These are powerful evidences for the historicity of the darkness at Christ’s crucifixion, and the earthquake. They were real historical events.